Chase the Higgs – or zap a pigeon? Some of my readers are bound to have noticed that I have a new hobby. It’s a great distraction from the daily climbing out of the permanent snowdrift currently blanketing Scotland – I exaggerate, but not that much! Having abandoned my resistance to social networking in recent weeks, I am now attempting to be joined at the hip to the whole cyber-world – now I really AM exaggerating…. Today’s fun was exploring http://www.diggit.com, to enable me to share mind-broadening, inspiring and entertaining material from across the Web with my readers at “Writing from the Twelfth House”. How about this for a brilliant cartoon, illustrating a fantastic article by Dan Satterfield at Dan’s Wild Science Journal? Enjoy the cartoon, and follow the link below it. Accessible science is what I hunt for……this is it! 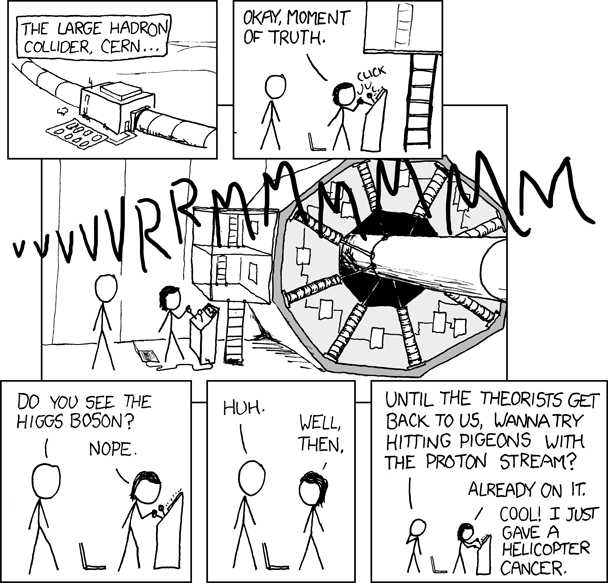 Catch the Higgs - or a pigeon? This entry was posted in Science for non-scientists! and tagged Anne Whitaker Writing from the Twelfth House, Dan Satterfield, Higgs Boson, Large Hadron Collider, Neil deGrasse Tyson. Bookmark the permalink. Anne, I just popped in with some festive greetings! Peace, love and much joy! my greetings are warmly returned to you and yours. I am just about to post an atmospheric winter picture from my local area with a Festive Greetings post to my merry band of readers. Thank you so much for all your support this year and blessings to you for the year ahead!